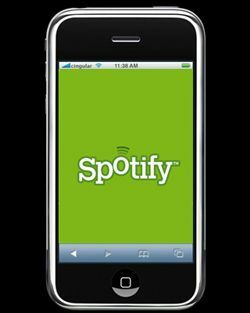 Spotify adds new playlist functionality to iOS app | What Hi-Fi? Spotify has just issued an update (version 0.4.13) to its iOS app for Apple portable devices including the iPhone and iPod Touch. It means you can now sync your playlists even when Spotify is running in the background. In addition, there's a new 'play queue' function which allows users to queue up tracks they want to listen to. Queued tracks will play immediately after the currently playing track. After all the queue tracks have played, the playlist or album you were playing from before will resume. Your Apple portable device will need to be running iOS 3.2 or above to work with these new features.